Bhutan is situated in the Eastern Himalayas of southern Central Asia and is bordered on the north and Northwest by the Tibet Autonomous Region of China and to the west, Southwest, south and east with Indian states of Sikkim, West Bengal, Assam and Arunachal Pradesh. Bhutan is a landlocked mountain kingdom roughly the size of Switzerland, in the eastern Himalayas. With a population of 600,000 spread over 46,000 sq km. 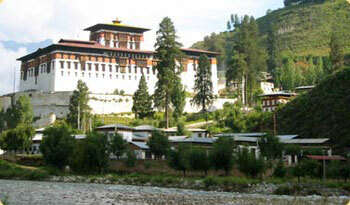 Bhutan is the last unspoiled Himalayan kingdom often known as Shangri-La. For a country of its size, Bhutan is a land of spectacular contrasts and stunning beauty. The southern foothills, at an altitude of 1,000 ft to 4,500 ft are covered by dense tropical forest, which abounds with wildlife. These regions are mostly inhabitated by Lhotsampas (Nepalese immigrants who are given Bhutanese citizens nationally) and most of them are agriculture workers. Most industrial areas are also located in southern region. The fertile central valleys (3,600 – 8,500 ft) are covered by verdant coniferous and deciduous forests and dotted with numerous monasteries, temples and dzongs. Western Bhutan’s major valleys of Ha, Paro, Thimphu, Punakha/ Wangduephodrang are intensely cultivated. The people in these valleys are well-to-do and they build large homes of rammed earth in which several generations often live together. The formidable Black Mountains, rising to over 16,000 ft forms a natural boundary between Western Bhutan and Central Bhutan. Central Bhutan is made up of several districts where different dialects are spoken. Khyeng, in the south, is covered by semi-tropical jungle and is famous for its bamboo and ratten ware. Further north is Trongsa, home of one of Bhutan’s most impressive dzongs. Bumthang’s four valleys, between 8,530 – 13,000 ft with their picturesque countryside, beautiful coniferous forests and numerous Religious sites are often known as the “Heart of Bhutan”. Eastern Bhutan, home of the Sharchops (“people of the east”), is generally warmer. The eastern women are renowned for their weaving skills and produce fine textiles of silk and cotton. Northern Bhutan, lying largely above 11,500 ft is region of glacial valleys, alpine meadows and is home to the semi-nomadic yak-herders of Lingshi, Laya and Lunana, have almost no contact with Western civilisation and trade only in bartered goods. Towering above this magnificent trekking country are the eternal snow-clad peaks of the majestic Jhomolhari, Jichu Drake and Gangkar Puensum, rising to over 23,000 ft.
Bhutan is a country nestled in the eastern Himalayas. The country has been visited by a great many saints, mystics, scholars and pilgrims over the centuries who not only came for their personal elucidation, but blessed the land and its people with an invaluable spiritual and cultural legacy that has shaped every facet of Bhutanese lives. Visitors and guests to the country will be surprised that the culture and the traditional lifestyle is still richly intact and at the degree to which it permeates all strands of modern day secular life. From the traditional woven garments to the prayer flags on high mountain slopes, from the built environment to the natural environment, from the religious mask dances to the folk dances, this cultural heritage is proudly evident and offers a unique cultural setting. The Bhutanese have treasured their natural environment as it is seen as a source of all life and the abode of the gods and spirits. Buddhism has been the predominant religion since the 7th century and has inculcated deeply the value that all forms of sentient life, not just human life, are precious and sacred. Given such a prevailing ethos which respects the natural environment, it is not surprising that the Bhutanese have lived in harmony with nature and that the nation has its environment still pristine and intact today. The country has been identified as one of the 10 bio-diversity hot spots in the world and as one of the 221 global endemic bird areas. Its eco-systems harbours some of the most exotic species of the eastern Himalayas with an estimated 770 species of birds and over 50 species of rhododendron, besides an astonishing variety of medical plants and orchids. Bhutan also has a rich wildlife with animals like the takin, snow leopard, golden langur, blue sheep, tiger, water buffalo and elephant. It is to safeguard this rich natural environment and culture, that the country has consciously adopted a controlled tourism and development policy. In 1997, just over 5,000 tourists entered the country and the numbers in the coming years are not expected to increase greatly. For the few who do travel to Bhutan, there are a wide variety of activites-from the Snowman trek to kayaking down the Mochhu; from witnessing the colorful festivals in the fortresses to the panoramic mountain flight on Druk Air. We hope that visitors who make the journey to Bhutan enjoy their experience and return home with glowing memories. Mystery surrounds Bhutan’s distant past, as priceless irretrievable documents were lost in fires and earthquakes. In the 8th century CE, Guru Rinpoche (Padmasambhava or second Buddha) made his legendary trip from Eastern Bhutan to Western Bhutan on the back of a flying tigress to subdue the evil spirits who hindered Buddhism. After defeating them, he blessed them as guardians of the doctrine. thus introducing Tantric Buddhism to Bhutan. Taktshang or Tigers Nest in the Paro Valley is where he landed and today it remains one of most sacred places in Bhutan. It is believed that the name Bhutan is derived from the Sanskrit ‘Bhotant’, meaning ‘the end of Tibet’, or from ‘Bhu-uttan’, meaning ‘high land’. Historically the Bhutanese have refered to their country as Druk Yul, ‘land of the thunder dragon’. Bhutanese refer to themselves as Drukpa people. Guru Rinpoche (Precious Master) is the father of the Drukpa Kagyu school of Tantric Mahayana Buddhism practiced in Bhutan. Shabdrung Ngawang Namgyal, a Tibetan lama of the Drukpa School, arrived in Bhutan in 1616 CE. He introduced the present dual system of religious and secular government, creating and building the system of Dzongs throughout Bhutan. Shabdrung unified the country, and established himself as the country’s supreme leader and vested civil power in a high officer known as the Druk Desi. Religious affairs were charged to another leader, the Je Khenpo (Chief Abbot of Bhutan). For two centuries following Shabdrung’s demise, civil wars intermittently broke out, and the regional Penlops (governors) became increasingly more powerful. This ended when an assembly of representatives of the monastic community, civil servants and the people, elected the Penlop of Trongsa, Ugyen Wangchuck, the First King of Bhutan in 1907-1926. The monarchy has thrived ever since, and the present Fourth King, His Majesty Jigme Singye Wangchuck (1972 to present), commands the overwhelming support for his people. The Kingdom of Bhutan lies in the Central Himalayas, between Tibet to the north, the Indian territories of Assam and West Bengal, to the south and east, and Sikkim to the west. The Kingdom has a total area of about 47,000 square kilometers, about the size of Switzerland. Located in the heart of the high Himalayan mountain range, Bhutan is a land-locked country surrounded by mountains. The sparsely populated Greater Himalayas, bounded to the north by the Tibetan plateau, reach heights of over 7,300 meters (23,950ft. ), and extend southward losing height, to form the fertile valleys of the Lesser Himalayas divided by the Wang, Sunkosh, Trongsa and Manas Rivers. Monsoon influences promote dense forestation in this region and alpine growth at higher altitudes. The cultivated central uplands and Himalayan foothills support the majority of the population. In the south, the Duars (the gates) Plain drops sharply away from the Himalayas into the large tracts of semi-tropical forest, savannah grassland and bamboo jungles. Bhutan is the only country in the world to retain the Tantric form of Mahayana Buddhism (Drukpa Kagyu) as its official religion. The Buddhist faith has played and continues to play a fundamental role in the cultural, ethical and sociological development of Bhutan and its people. It permeates all strands of secular life, bringing with it a reverence for the land and its well being. Annual festivals (tshechus and dromchoes) are spiritual occasions in each district. They bring together the population and are dedicated to the Guru Rinpoche or protective deities. Throughout Bhutan, chortens or stupas (receptacle for offerings) line the roadside commemorating places where Guru Rinpoche or another high Lama may have stopped to meditate. Prayer flags dot the hills, fluttering in the wind. They allow Bhutanese people to maintain constant communication with the heavens. While urban settlements have sprung up with the process of modernization, the majority of Bhutanese people still live in small rural villages. Small family farms are the predominante way of life and the farmer the most common occupation. As the altitude rises, crops give way to cattle and yak breeding with herds grazing in the high pastures. The Bhutanese diet is rich in meat and poultry, dairy, grain (particularly rice-red and white) and vegetables. Emadatse (chili pepper and cheese stew) is considered the national dish with many interpretations to this recipe throughout the country. Poulry and meat dishes, pork, beef and yak, are lavishly spiced with chilies, and it is common to see bright red peppers drying on rooftops in the sun. Salted butter tea, or suja, is served on all social occasions. Chang, a local beer, and arra, a spirit distilled from rice, maize, wheat or barley, are also common and widely favored. Doma or betel nut, is offered as a customary gesture of greeting. The Bhutanese way of life is greatly influenced by religion. People circumambulating (kora) the chortens with prayer beads and twirling prayer wheels are a common sight. Every Bhutanese home has a special room used for prayers, a chosum. The form of government in Bhutan is as unique as the country. It is the only Democratic Monarchy in the world. His Majesty King Jigme Singye Wangchuck is Bhutan’s fourth king. A very special man who has kept the culture and traditions of his county intact while listening to the voice of his people. One of the six development goals HM King Jigme Singye Wangchuck has expressed is: People’s participation and decentralisation in the government. Inherited from Shabdrung Ngawang Namgyel’s administrative system of the 17th century.Bhutan is divided into 20 Dzongkhags (dzong districts or states, see map above), each with its own elected 3 year representative, a Dzongdag (district chief). In 1988, four Dzongde (zones) were set up as administrative units between the district level and the central government. A group of four districts make up one zone, which is headed by the Dzongde Chichab (Zonal Administrator) with authority over the district chiefs in the area. All districts are divided into blocks, administrative units that include several villages. At the block level, government orders are transmitted through an elected representative the Gup (village headman). The Tshogdu, or National Assembly has 154 members who fall into 3 catagories. The largest group with 105 members are the Chimis. Representatives of Bhutan’s 20 dzongkhags. The regional monk bodies elect 12 monastic representatives who also serve 3 year terms. Another 37 representatives are civil servants nominated by the king. They include 20 Dzongdags, (district administrators or mayors): The old term for Dzongdag is Penlop (Governor), the first king was the Penlop of Paro and Thimphu) ministers, secretaries of various government and other high ranking officials. The Tshogdu meets in Thimphu twice each year and is presided over by an elected speaker. The speaker may also call special sessions during emergencies. The Tshogdu body passes all the kingdom’s legislation by a simple majority vote. Early records suggest scattered clusters of inhabitants had already settled in Bhutan when the first recorded settlers arrived 1,400 years ago. Bhutan’s indigenous population is the Drukpa. Three main ethnic groups, the Sharchops, Ngalops and the Lhotsampas (of Nepalese origin), make up today’s Drukpa population. Bhutan’s earliest residents, the Sharchops (people of the east) reside predominantly in eastern Bhutan. Their origin can be traced to the tribes of northern Burma and northeast India. The Ngalops migrated from the Tibetan plains and are the importers of Buddhism to the kingdom. Most of the Lhotsampas migrated to the southern plains in search of agricultural land and work in the early 20th century. The current population is approximately 750,000. Bhutan’s official language is Dzongkha. Given the geographic isolation of many of Bhutan’s highland villages, it is not suprising that a number of different dialects have survived. Bhutan has never had a rigid class system. Social and educational opportunities are not affected by rank or by birth. Bhutanese women enjoy equal rights with men in every respect. To keep the traditional culture alive, Bhutanese people wear the traditional clothing that has been worn for centuries. Bhutanese men wear a gho, a long robe tied around the waist by a small belt called a kera. A woman’s ankle length dress is called a kira, made from beautifully colored and finely woven fabrics with traditional patterns. Necklaces are fashioned from corals, pearls, turqoise, and the precious agate eye stones which the Bhutanese call ‘tears of the gods’ or dzi beads.